6:00 pm: start your ukulele journey! beginner class ages 10 - 100. limited seating. find out how much fun you can have with a ukulele!! 7:00 pm: join the band — survivor girl ukulele band!! 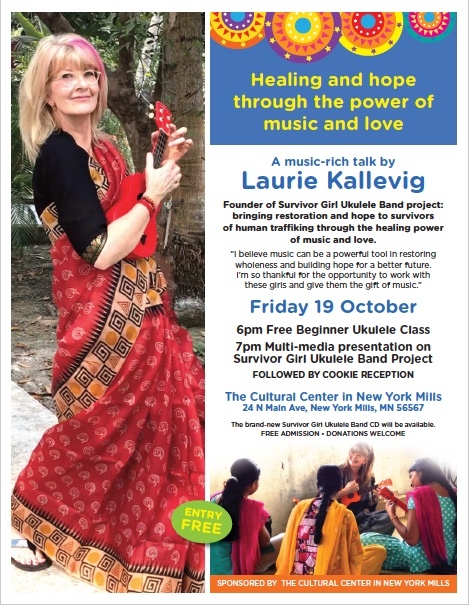 laurie kallevig, founder of survivor girl ukulele band project, will tell you all about her wild and unique work in kolkata, india, working with girls in a rescue shelter home and teaching them how to play the ukulele. why: it’s a multi-media presentation that will be sure to touch your heart. plus: and afterward we’ll have some cookies!